Bechtel, Lockhed Martin, Boeing, Pharma und Zigaretten Konzerne schrecken nicht vor Mord zurück im Ausland, kaufen sich jeden Politiker, was als Lobby Consults getarnt ist, oder Hillary Clinton Stiftung, wo man von Regierungschefs, Geld erpresst. Im Mai veröffentlichte interne Dokumente haben einmal mehr die Verstrickung des US-amerikanischen Konzerns Chiquita, des auf Anbau und Vertrieb von Bananen spezialisierten Nachfolgers der United Fruit Company, mit paramilitärischen Gruppen in Kolumbien bestätigt. An die Öffentlichkeit gebracht wurde das Material von der US-amerikanischen regierungsunabhängigen Plattform National Security Archive. Der Konzern hatte zuvor versucht, die Publikation juristisch zu unterbinden, war jedoch vor Gericht gescheitert. Die pikanten Inhalte der Dokumente könnten nun im Zuge des kolumbianischen Friedensprozesses zu einer weiteren strafrechtlichen Verfolgung der Verantwortlichen führen. Denn nachdem die US-amerikanischen Behörden den Sachverhalt jahrelang verschleiert hatten, sind nun erstmals die Namen der Drahtzieher bekanntgeworden. These documents are among thousands that Chiquita turned over to the U.S. Justice Department as part of a sentencing deal in which the company admitted to years of illegal payments to the paramilitary United Self-Defense Forces of Colombia (AUC)–a State Department-designated foreign terrorist organization–and agreed to pay a $25 million fine. The Archive has obtained more than 5,500 pages of Chiquita’s internal documents from the Justice Department under the Freedom of Information Act and is publishing the entire set online today. Key documents from the Chiquita Papers are included in the recently-published document collection, Colombia and the United States: Political Violence, Narcotics, and Human Rights, 1948-2010, now available as part of the Digital National Security Archive from ProQuest. The documents provide evidence of mutually-beneficial „transactions“ between Chiquita’s Colombian subsidiaries and several illegal armed groups in Colombia and shed light on more than a decade of security-related payments to guerrillas, paramilitaries, Colombian security forces, and government-sponsored Convivir militia groups. The collection also details the company’s efforts to conceal the so-called „sensitive payments“ in the expense accounts of company managers and through other accounting tricks. The Justice Department investigation concluded that many of Chiquita’s payments to the AUC (also referred to as „Autodefensas“ in many of the documents) were made through legal Convivir organizations ostensibly overseen by the Colombian army. New evidence indicating that Chiquita benefited from the illicit payments may increase the company’s exposure to lawsuits representing victims of Colombia’s illegal armed groups. The collection is the result of an Archive collaboration with George Washington University Law School’s International Human Rights and Public Justice Advocacy Clinics and has been used in support of a civil suit brought against Chiquita led by Earth Rights International on behalf of hundreds of Colombian victims of paramilitary violence. Among the officials most supportive of the Convivir groups during this time was Álvaro Uribe, then the governor of Antioquia, the hub of Chiquita’s operations in Colombia. Thomas‘ September 2000 memo notes that, „It was well-known at the time that senior officers of the Colombian military and the Governor of the Department of Antioquia were campaigning for the establishment of a Convivir organization in Uraba.“ A 1995 memo indicates that both Uribe and another politician, Alfonso Nuñez, received substantial donations from another of Chiquita’s Colombian subsidiaries, Compañía Frutera de Sevilla. Uribe was president of Colombia from 2002-2010. The key that unlocks many of the mysteries of the Chiquita Papers is the secret testimony given by Kistinger and six other Chiquita officials during the SEC’s expansive bribery investigation. 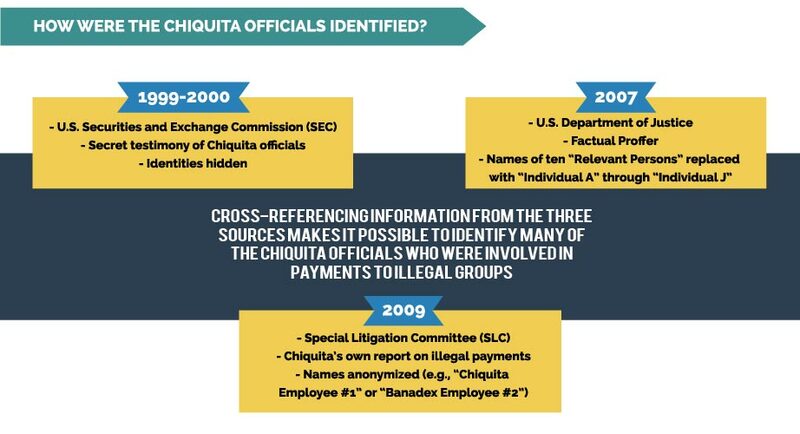 Through a relatively simple, if laborious, process of cross-referencing among the three sources, it is possible to identify almost all of the individuals whose names were scrubbed from the Factual Proffer, the SLC Report, and the SEC testimony—effectively stripping away the redactions that have shielded Chiquita personnel from scrutiny and that have helped guarantee impunity for individuals linked to the payments. The records are the primary evidence behind a 2016 declaration (submitted by the author) identifying Chiquita “persons of interest” in the pending U.S. civil litigation. Those positively identified through this process include members of Chiquita’s board of directors, the corporate security team, regional and country operations managers with responsibility for Colombia, accountants and internal auditors, attorneys, and third-party bagmen who, over more than a decade, facilitated, negotiated, and delivered payments directly to guerrillas and paramilitary groups.